In the latest assault on our freedoms, Eric Holder is suing the US Supreme Court that states the UN treaty trumps our Constitution! As you already know, John Kerry also committed treason when he signed the unconstitutional UN Arms Treaty despite the US Senate garnering the 53 votes necessary to block it from ever being signed. Many members of the federal government are working hard to destroy the sovereignty of the United States! Virtually every single day there is more news of the treachery. It’s coming fast now folks! The Department of Justice (DOJ) and Eric Holder thinks to pull a fast one on the American People.Eric Holder filed a law suit with the United States Supreme Court that says United Nations treaty trumps the US Constitution on laws in the United States. 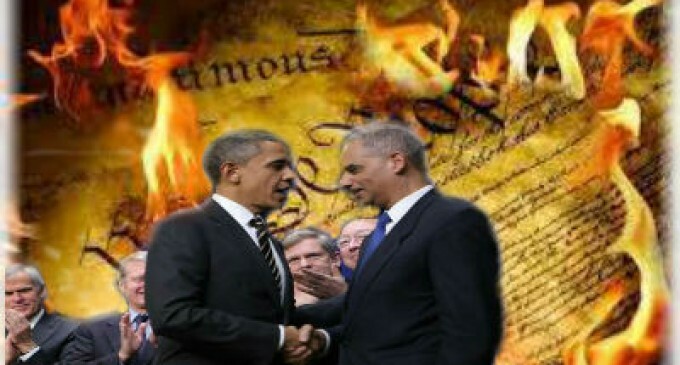 The Senate that has already had the majority say they will not approve President Barack Obama and Secretary of State John Kerry’s treasonous plans to circumvent the United States Constitution with the United Nations Small Arms Treaty. Already 50 Senators banned together and sent a letter to the White House and said no! Don’t let that stop President Obama from going out of his way again. The Department of Justice Attorneys led by Eric Holder have just started advancing an argument at the Supreme Court that could allow them to invoke international treaty for policies such as gun control and conflict with in the United States. This would include conflicts like the planned EBT shortage. It would also enforce the unconstitutional UN Small Arms Treaty that was signed by John Kerry despite the US Senate garnering the 53 votes necessary to block it from ever being signed. The act itself was committing Treason under Article 3 of the Constitution. This petition filed by the DOJ and Obama’s Administration would give them the power and authority to implement the treaty signed by the US and allow federal prosecutors the right to prosecute criminal cases that would be normally handled by state and local authorities. One might also argue if this gives the DOJ the authority to over ride the ruling of Posse Comitatus or the ruling of international troops on US Soil! The Constitution created a limited federal government with only specific enumerated powers,” Cruz told the Washington Examiner prior to giving a speech on the issue today at the Heritage Foundation. The precedence is based off a decision on the Supreme Court Case Bond Vs The United States, in which a woman was video taped putting poison into the tail pipe of a jilted ex-lover’s car. Holder and the DOJ successfully argued to over ride the State’s jurisdiction to try this for attempted murder and instead be allowed to at least be heard on taking these cases from the state and prosecuting it under the Chemical Weapons Convention Implementation Act. Posting the URL address of this article does not allow the image of Holder & Obama to come up. AND trying to copy the image on your site does not work. Your site is coded to not allow this. SAD… you defeat yourself!!! I hope the American People wake up REAL soon,or there will be no more AMERICA.